All meals onboard Ghan Expedition, FREE beverages throughout your journey, FREE toiletries kit, in-cabin music and commentary, use of "Outback Explorer Lounge"
This package incorporates the extended 4 day Ghan ‘Expedition’ version of the Ghan journey, which expands the classic Ghan experience by an extra day. This epic journey enables you to stop and immerse yourself in some of the most remote yet captivating parts of Australia in style and luxury. Extras Include: extra night aboard The Ghan, extended and more active off-train excursions, special BBQ dinner in Alice Springs, immersive Katherine touring/cruising options, full day in Coober Pedy where touring options come with a delicious gourmet lunch. Plus you have all of the classic Ghan inclusions. 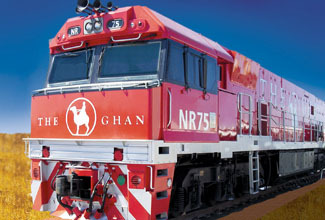 Most Ghan Darwin packages can also be upgraded to the popular Ghan Expedition, simply ask. Fly to Darwin this morning and feel the spirit of the Top End. You will be personally met by a DISCOVER AUSTRALIA representative and transferred from the airport and transferred to your central Darwin hotel to begin your adventure. 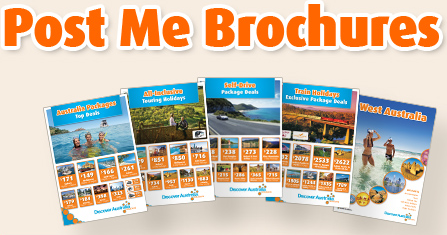 Meet and Greet Personalised Arrival Transfer, Overnight Darwin Accommodation. The tropical northern city of Darwin is located on a massive and spectacular harbour on the Timor Sea. It has a multicultural population of 129,062 people, that is a melting-pot cultures from more than 50 countries, who pride themselves on their unique and friendly laid-back lifestyle. Darwin has year round balmy weather and has many popular attractions including Aquascene, Burnett House, Casuarina Coastal Reserve, Charles Darwin National Park, Cullen Bay Marina, Darwin Convention Centre, Deckchair Cinema, East Point Reserve & Lake Alexander, Fannie Bay Gaol, George Brown Darwin Botanic Gardens, Indo Pacific Marine, Lyons Cottage, Mindil Beach Sunset Markets, Museum & Art Gallery of the NT, Northern Territory Parliament House, USS Peary Memorial and the fascinating World War II Oil Storage Tunnels. There is plenty to see and do in our magnificent and vibrant Top End. Your Coach Tour today includes: see Smith Street Mall, Mitchell Street (restaurants and cafes), St Mary's Cathedral, Cavanagh Street (old China Town), Chinese Temple, Stokes Hill, Fort Hill Wharf, Trendy Darwin Wharf precinct on the harbor, World War II oil storage tunnel, Christ Church Cathedral, Supreme Court of the Northern Territory, Government House, Parliament House, Bicentennial Park, The Esplanade, Casino Mindil Beach (Darwin's famous market is located here). Visit the Museum & Art Gallery. Learn about Cyclone Tracy (mother nature's hand in changing this city). See the upmarket Fannie Bay and Darwin Botanical Gardens. Spot for wallabies in the grasslands. Luxury Darwin City Tour with Hotel Pick Up, Overnight Darwin Accommodation. Spend the next 3 days exploring Darwin at your own pace. You may choose to visit one of the world famous National Parks surrounding Darwin such as Kakadu National Park and Litchfield National Park or take a cruise on the Corroboree Billabong. Alternatively, spend the days exploring the restaurants and cafes of famous Mitchell Street, get up close to saltwater crocodiles and other Northern Territory fauna at Crocosaurus Cove or learn about Darwin’s rich history at the Royal Flying Doctor Service. Beginning in Darwin, this epic four day journey will take you to some of the most remote yet captivating parts of Australia. You will be personally met at your hotel by a DISCOVER AUSTRALIA representative and transferred to the Ghan railway station begin your adventure. See below for full details on your Ghan Expedition journey. Enjoy an extra night on the Ghan and upgraded off-train excursions including a special Outback Pioneer BBQ dinner under the stars in Alice Springs, immersive Katherine / cruising options and a full day of touring options in Coober Pedy which include a gourmet lunch. Your Outback Pioneer Dinner includes live Australian music, and a fest of steak and traditionally made damper before enjoying informative astronomical talk under the stars. Another truly unique experience on the Ghan Expedition is an optional scenic fixed wing flight over Uluru. This is a wonderful way to take in the vastness of the Red Centre and one of Australia’s most iconic landmarks. Your friendly tour guide awaits your arrival in Manguri to take you for your full day excursion to the opal mining capital of the world, Coober Pedy. Explore the tunnels and caves of this underground town and visit an underground Serbian Orthodox Church and mine for riches before setting of for the Breakaways and continuing your journey towards the rolling green landscapes of South Australia. On arrival in Adelaide, you will be personally met by a DISCOVER AUSTRALIA representative and transferred to Adelaide airport for your flight home. Alternatively, why not extend your stay and visit the sights and surrounds of Adelaide or maybe visit world famous wineries of the Barossa Valley and Clare Valley. Meet and Greet Personalised Rail Transfer, 3 Nights Gold Service Cabin on the Ghan Expedition, 4 Breakfasts, 3 Lunches, 3 Dinners, Luxury Alice Springs Touring, Special BBQ Dinner, Luxury Katherine Gorge Tour, Luxury Coober Pedy Tour with Gourmet Lunch, Optional Scenic Flight of Uluru, Meet and Greet Personalised Departure Transfer. Relax in your private Gold Service Cabin and watch the red heart of Australia pass by through your large window. Enjoy all meals onboard the Ghan Expedition in the stylish Queen Adelaide Restaurant Car (flexible times, hearty breakfasts, two course lunches, three course dinners). Your package includes FREE soft drinks, beers, high-quality standard wines, base spirits, tea and coffee throughout your journey on board. You will also receive a FREE toiletries kit. You have Cabin Steward Service, in-cabin music and detailed journey commentary (available from your cabin sound system) and you will love the cosy but exclusive atmosphere of the Outback Explorer Lounge. Your package includes Gold Service but can be upgrade to Platinum Service. You will be personally met by a DISCOVER AUSTRALIA representative and transferred from Darwin airport to your hotel, from your hotel to the railway station and from the railway station on arrival in Adelaide to the airport to meet your flight home. Alice Springs: Choose from a selection of included tour options and the Outback Pioneer Dinner. Coober Pedy: Full day in Coober Pedy. Tour the tunnels and caves of this underground town, visit the underground Serbian Orthodox church, see Umoona Opal Mine, enjoy a gourmet underground lunch and visit the Breakaways stunning outback moonscape. Upgrade to Platinum Service to join a select group of passengers that will experience the very best in luxury train travel onboard the Ghan including the new and exclusive Platinum Club Car. Platinum Service includes: Spacious private lounge style cabins, premium ensuite cabin with twin or double bed, panoramic views to each side, personalised cabin steward service, private transfers to and from your journey (up to 50kms), generous luggage limit (3 x 25kg), the new and exclusive Platinum Club Car, Outback Explorer Lounge and Queen Adelaide Restaurant access, Off Train Excursions, all onboard meals including breakfast, lunch and dinner, breakfast served to you in your cabin if you choose (new regional based menu), standard wines, beers, spirits and soft drinks are also included. The indulgent Platinum Service cabins are nearly twice the size of Gold Service cabins and come with premium fittings. The large panoramic windows give you the best seats onboard the Ghan plus you have an interior window to give you views of both sides of the train at the same time. During the day, your cabin will be configured as a private lounge, with deluxe lounge seating, a table and two ottomans. By night, it is converted to a comfortable bedroom, with either a double bed or twin beds. Platinum Upgrades start at $1740 per person. All packages can be upgraded to include luxurious Platinum Service, simply ask. The Ghan Expedition with Darwin Discover is very popular. Many dates book out well in advance, please book soon.